The holiday weekend threw my time sense off and I missed the weekly reset for Destiny. The Nightfall this week is Fallen S.A.B.E.R. with ‘grounded’ (because why not stand on the electrified floor) chaff, trickle and small arms. The Weekly Crucible is Zone Control (hold your captured zones or you won’t gain enough points on kills to win). Xur is in the Vanguard Hall this week. (where Cayde and the Vanguard leaders hang out) Continuing his streak of having nothing I can use he has…nothing I can use. However, if you got your game this past Christmas and are exotic poor he has the Ram, the MK 44’s and the sealed spine (the shiny hunter arms). Today is Kahuna’s birthday! He is Greywrath on Xbox One so if you see him in Crucible today give a him a quick wave before you blast him off the map. Bethesda announced a Fallout 4 bugfix/patch is in beta. If you play on PC you can head to Steam and try it out. They are working a huge list of features but my most anticipated are the settler status menu and that wires will no longer require copper. I am also pleased they are adjusting Preston and the never ending Minuteman quests. He is a fun companion but gets so much hate because of the settlement quests. For a full list of fixes and features check out the Fallout 4 forums . I spent a good sized chunk of my caps on a cool gun so MacCready and I are running missions-for-pay to try and recoup the money and pick up crafting supplies. I need to increase my water production in Sanctuary but since it isn’t on the supply line I have to carry all the components in myself. (Word of caution – don’t give MacCready a missile launcher unless you enjoy having the world explode in your face every time he sees a radroach). The Division will open briefly for Xbox Beta on January 28th (the 29th for PC and PS4) and run till the 31st. The beta is enormous so Ubisoft is allowing it to be downloaded 48 hours before it opens for play. 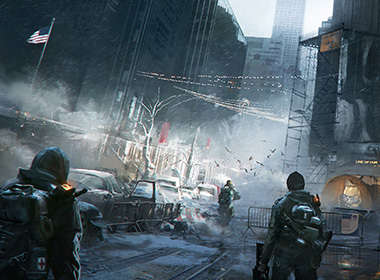 You can pre-order the game for a guaranteed beta key or sign up on the Division website and hope you are chosen. I’m going to have another cup of coffee, watch the snow fall and play a few video games. Have a safe and happy weekend.